Puja Thali (size: 7-8 inch), and 6 candle Diya. with Haldirams Pure Ghee Laddoo 250 gms. and Puja Samagri Packet. Puja Thali (size: 7-8 inch), and 6 candle Diya. with Haldirams Pure Ghee Laddoo 500 gms. with Puja Samagri Packet and Free Silver Plated Laxmi Ganesh Coin. 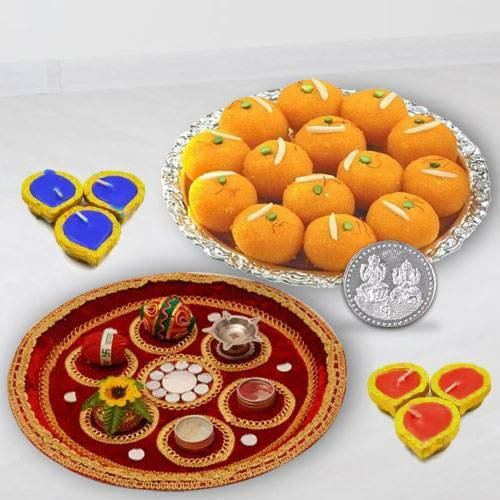 Puja Thali (size: 7-8 inch), and 6 candle Diya.with Haldirams Pure Ghee Laddoo 1 kg. with Puja Samagri Packet and Free Silver Plated Laxmi Ganesh Coin.